One idea I have for this blog is to post articles about my "Top Three" favorite fragrances in various categories, such as my favorite wood fragrances, leathers, vetivers, gourmands, powerhouse scents, etc.. I think it breaks up the monotony of just having reviews, reviews, reviews here. One thing to keep in mind when you read these posts, however, is that I will be writing about my personal Top Three favorite fragrances, not necessarily what are considered the best in their category. 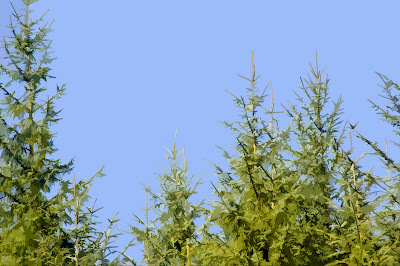 What better scent to start with than the wonderful smell of pine? It's one of the best smells on earth, in both perfume and in nature, and I can't imagine anyone actually hating the smell of pine. It's a brisk, woody and invigorating smell, and it never fails to lift my spirits. 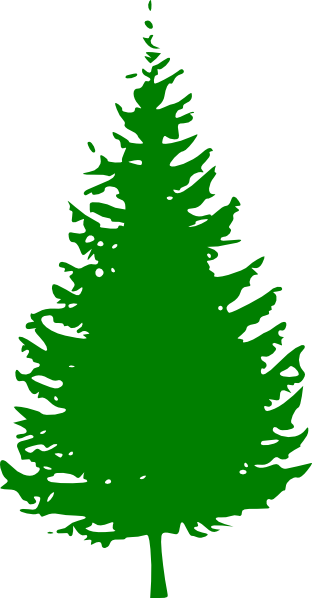 Unfortunately there aren't a lot of pine fragrances available in the U.S., and I think that's because many people in this country associate pine oil with the smell of Pine Sol or other industrial bathroom cleaners. Even though I don't agree with that assessment, that's fine by me. I like Pine Sol. 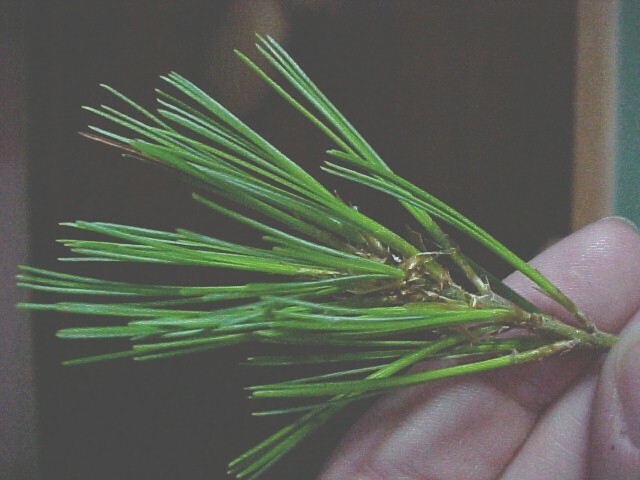 I look at pine as having two different smells. The first is the smell of the pine tree's needles and sap. This is a woody, sharp and resinous smell that is intense. Just crush some pine needles up in your hand, sniff them up close, and you'll know what I'm talking about. 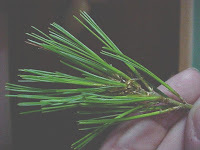 The needles are where the essential oil of pine comes from, and is what is added to perfumes. It's a great smell, but unfortunately it's a smell that usually disappears within a few minutes. Typically, you'll smell the pine oil when you first spray the cologne on, in the cologne's top notes, and its smell is usually gone in about ten minutes. 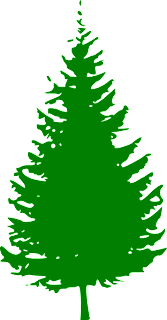 A well constructed pine fragrance will use other, longer lasting coniferous (i.e., of trees that have needles rather than leaves) woody notes like cedar, cypress or juniper to sustain that piney smell for a number of hours. I'll discuss those later in my Top Three. 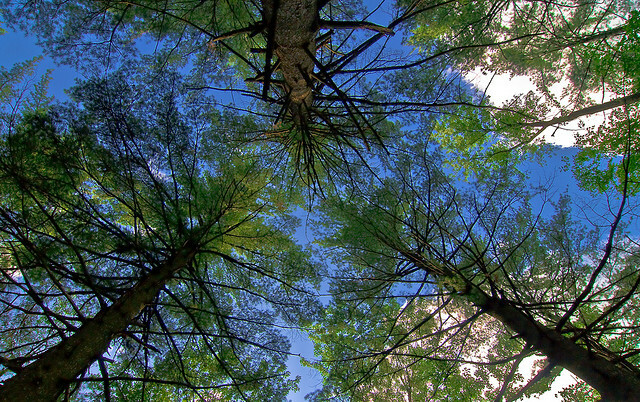 The other type of pine smell is that of a pine forest. Although I love the smell of pine needles, for me the smell of pine trees in the woods, in perfume form, is even more impressive. 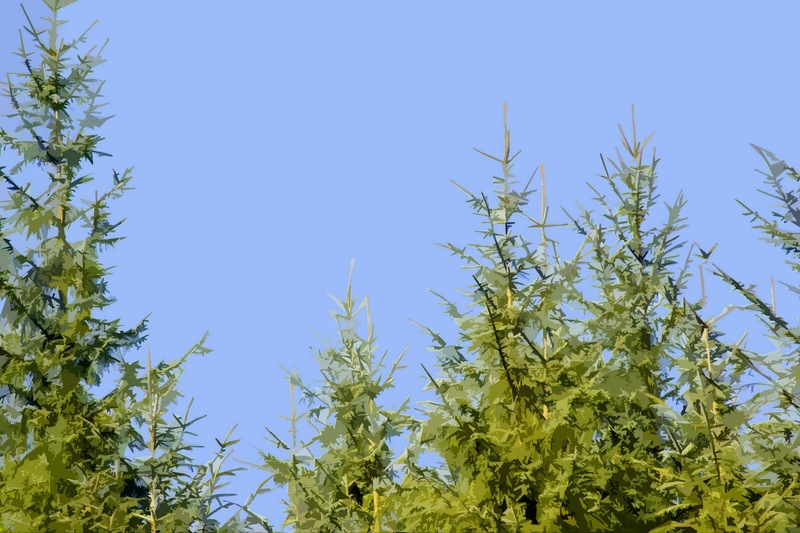 Unlike the scent of pine sap or needles, what we're talking about here is the smell of pine as it mixes with the outdoor air. In other words, what pine smells like when you're standing a distance away from the tree, rather than having your nose pressed up against some sap on the bark of the tree, for example. It's a much airier, more transparent, warmer and less intense scent than that of pine sap. Now on to my Top Three. I know there are a number of expensive niche fragrances that contain good pine smells, such as Blenheim Bouquet (Penhaligon's) and Eloge du Traitre (Etat Libre d'Orange), but my personal favorites happen to be bargain basement cheapies, price-wise, not scent wise. These are superb fragrances. Each can be purchased online for less than $30 US for a big 100 ml. bottle. This old-school classic is a no-brainer, as it's often the first fragrance people think of when the word "pine" is mentioned. The bottle is shaped like a pine cone, so what do you expect? 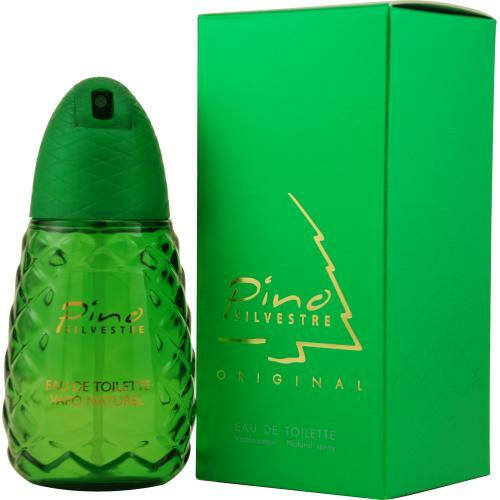 Pino Silvestre is the best example of what I described as the smell of a pine forest. It's an aromatic fougere that uses a whole slew of green herbal notes to create what smells like a warm breeze blowing through a pine forest. It's airy and transparent, and most importantly, it smells extremely green! 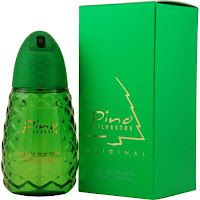 I've walked through a lot of pine forests, and Pino Silvestre does a better job of replicating the incredible smell of forest air than any other perfume I've ever smelled. Interestingly, Mavive (the company that makes Pino Silvestre) on their website does not list pine as an ingredient in this fragrance. This is surprising when you consider this is a fragrance with the word "Pino" ("pine" in Italian) in its name and a pine cone-shaped bottle. However, as I said earlier, this fragrance is not the intense smell of pine needles, so in that respect it's not such a surprise. Pino Silvestre is an incredible fragrance, and it costs almost nothing. It's one of my favorite perfumes, period. For any fan of herbal, pine or old-school Mediterranean-styled fragrances, there is no excuse not to own a bottle of this. I give this a rating of 10 out of 10. It's that good. This fragrance isn't generally considered to be a pine fragrance, but for me it is. I'm not going to rehash my prior review of this, except to reiterate that Carlo Corinto captures the smell of having a Christmas tree in your house, needles, sap and all. Unlike Pino Silvestre, Corinto has the smell of pine needles close up. It's classified as an oriental fragrance, but any amber or vanilla in this merely gives warmth to the bright, cheerful and crisp pine tree smell, rather than bogging it down with sweetness. While I wouldn't call it a dry fragrance, it's far from being a typical sweet syrup-fest like many oriental scents ae. 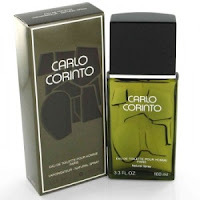 What I love about Carlo Corinto is that it manages to sustain that wonderful pine tree smell for several hours, and I suspect it does so with its skillful use of cedar and juniper. So what if technically it's not pine I'm smelling all this time? If it smells like pine and my brain thinks it's pine, then it's pine enough for me. Agua Brava, by Antonio Puig, is legendary in Spanish and Latin cultures, and rightfully so. It's a quintessential Mediterranean fragrance - herbal, citrusy, woody and totally natural - and it happens to also be one of the best representations of pine and coniferous aromas I know of. 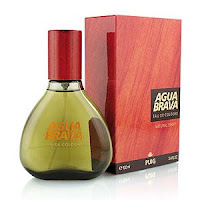 What's great about Agua Brava is that it captures both the smell of pine needles and the smell of a pine forest. I suspect that this is what Pino Silvestre would smell like if it contained large amounts of pine needle oil or pine sap. For me, it's the smell of Mediterranean sunshine in the woods. Everything is well balanced, with every ingredient contributing to the greater whole. The pine and herbal notes blend beautifully together to create that foresty smell, and everything is rounded off smoothly with a very light and dry dose of leather. Like with Carlo Corinto, I suspect that cedar and other woody notes are in Agua Brava to help sustain the pine-like smell. Even so, I still think of pine trees when I wear this, and that's what counts. Like Pino Silvestre, I also think this fragrance is fully deserving of a 10/10 rating. So there you have it, my three favorite pine scents. Don't be scared off by their cheapo prices; I picked these three purely on merit, not to make a pitch for inexpensive perfumes. This list may change as time goes on and I try new pine fragrances, but I'll always at least love these three. If I find a new pine scent that trumps any of these, I'll be sure to let you all know! I'm glad you're enjoying the blog. I'm not a big fan of bay rums. I don't hate them, but I don't wear them much, mainly because of their poor longevity. Right now, I only have one bay rum - Pinaud's Virgin Island Bay Rum. I like it, and will write a review of it. However, I can't say I have any other bay rums I'm looking to add to my collection, but I could do a couple of reviews of a few I've owned in the past. I have created my own Bay Rum Version according to a formula from way back when(Bay,All Spice,Orange Zest)by diluting everything in Jamaican Rum. The poor longevity has been solved by adding Glucam P20, a fixateur that gives this whole blend staying power 'till next Christmas.Since Bay Rum is virtually unknown here in Germany, I have already sold quite a few bottles. I've tried adding Glucam P20 to some of my own creations, but I've found that it kills the top notes. I think I've been adding too much of the stuff. 5% of your fragrance concentrate at the most -according to Linda Andrews from "The Perfumer's Apprentice"!I've added 1 ml to an already made 100ml Bay Rum Bottle and it turned out great. This looks like it's up your alley. Oh absolutely. It costs like $110 for a 50 ml. bottle, a hefty price, but it sounds awesome enough to do a blind purchase. I couldn't imagine not loving it. Man shamu1 you must really like herbal frags to give Pino Silvestre a 10. Tried it the other day and it just reminded me of a spice rack that had crashed open under my nose. Being of Italian decent I would find it almost comical to walk around smelling like this hahaha. But if you were really in to green herbal scents then yes this does it well that's for sure. Agua Brava on the other hand seemed much nicer to me but I was already pretty loaded up this test sprays to really give it attention. I'll have to go back for that one. I usually think of pine scents as Italian in style, but I can't say that's what comes to mind with Pino. Mediterranean, yes, but not necessarily something I'd think of as being from Italy. The strong herbal smell smells more Spanish in style to me. Hello : I'm from Barcelona , and I like Quorum by Puig , and Agua Brava by Puig . Shamu1, I recently picked up a bottle of Pino Silvestre Pine Gems Essence, as I love, love, LOVE green-smelling fragrances. Have you ever smelled this? If so, I'd be interested in your take on it. I'm not a betting man, but, based on your reviews over the years, I'd bet you like the original Pino better as it is louder, rougher around the edges, and more citric. Glad you're back to blogging. No but now in all seriousness, this blog seems to be the ultimate answer to my questions, the best guide on my journey. Which is to find the perfect scent, my signature fragrance. And funny enough, I LOVE green scents! To me, a mens frag has to be masculine, manly, NOT too sweet! It could be sharp, musky, animalic, spicy, or....GREEN! I absolutely adore the smell of fresh turpentine (the natural kind, that you get from pine resin) and have been on the lookout for really good green scents from the start: NOT so easy to find, let me tell you! The only other requiremnet would be that it performs: another difficult one especially after the 2015 eu regulations banning oakmoss, etc. I expect a frag to project, so others will smell it, and to last: at LEAST 8 hours. On top of that my skin doesn't seem to like to hold on to frags too well, or it simply absorbs them, I dunno. Which of the green smells would you say has the best performance?